By 1790 Amherst had already surpassed Hadley in numbers. In Amherst there were 176 houses with 1,233 people, while Hadley had 132 houses with 882 inhabitants ("Population by town"). View the Head of Household census list for Amherst in 1790. Amherst’s population rose 53 percent during the mid-1800s. During this time 73 percent of the foreign-born population were Irish, with a smaller percentage of Canadians and English. Most of the immigrants worked as laborers and semi-skilled craftspeople and many settled in tight residential clusters near McClellan Street (adjacent to the Catholic Church) and in the Taylor, Gray, and High Street area. The influx of immigrant workers was reflected in the small religious enclaves such as the Nuttingville Methodist Church (1848) on the corner of South East Street and Bay Road. It was used until 1875 and grew in response to the growth of the Catholic parish. The Methodist Church in Cushman (ca. 1844), which drew its largest numbers from the factory workers, began to decline in the middle of the century. By 1858 it had no regular pastor, although Amherst College students preached there occasionally. The Irish immigrants who began arriving about 1840 were served by traveling clergy in the 1850s and 1860s. St. Brigid’s Roman Catholic Church was organized in 1869 and the first building was erected by 1871. That structure was later modified and converted into the Cathedral Apartments. 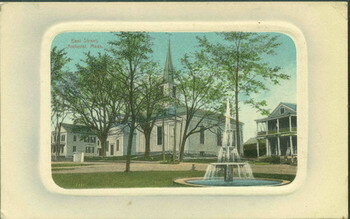 The Second Congregational Church in East Village, the Grace Episcopal Church (informally affiliated with Amherst College), and the First Congregational Church buildings were all constructed during the mid-nineteenth century. In 1868, Amherst College trustees gave land at the corner of Northampton Road and Parsons Street to the Zion Church, which was established in 1861. At that time there were 91 African Americans in Amherst. Students at Amherst College engaged in mission work at the church and although there are records of an itinerant black preacher in the 1850s, the congregation had a white organist, Mary Snell, and two white ministers during the 1860s. "Population by town." Hampshire County, MA 1790 Census. RootsWeb at Ancestry.com. "Amherst, Hampshire, County, MA 1790 Census Sorted By Head of Household." Hampshire County, MA 1790 Census. RootsWeb at Ancestry.com.